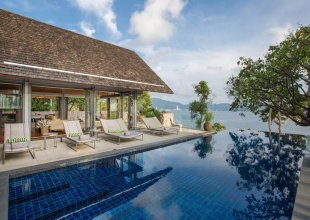 The View Built into a lush, forested cliffside overlooking an unspoilt sand-swept cove on Samui\'s secluded southwest coast, the View lives up to its name with 180 degree vistas of island-peppered ocean splendour from almost every room in the villa. The rich medley of sea and sky provides a constant backdrop to the stay, as you drift between indoor and outdoor pleasures. 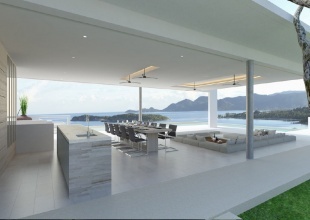 Sava – Villa Essenza is a chic tropical residence enhanced by a range of sophisticated, modern luxuries. The villa offers 6 spacious en-suite bedrooms - three on the upper level, three poolside - two of them sea facing master suites with floor to ceiling windows sliding open onto superb views. 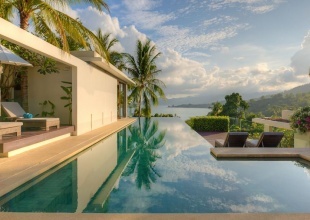 Villa Katrani expertly fuses the best of a private villa and a luxury resort. This beautiful hilltop property offers a sophisticated, Zen-like atmosphere. 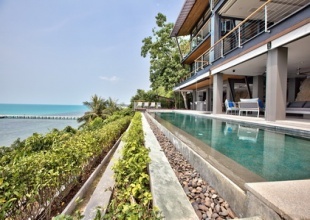 Located in Taling Ngam, a natural haven, the vacation rental offers spectacular views of Koh Samui’s turquoise waters and white sand beach from every angle. Old and New World styles blend seamlessly in this gorgeous 5-bedroomed villa, whose courtyard and irresistible salt-water pool are surrounded by pavilions on three sides for additional privacy. To the villas rear are a large family bedroom and two twin rooms, while the pavilion to the pools right houses a double bedroom with outdoor bathroom as well as the master suite. 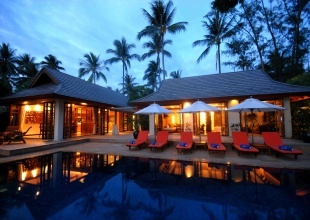 Set within a tropical garden, this villa is a luxuriously designed four-bedroom villa with panoramic sea views. All bedrooms have their own en-suite bathrooms, with two of the bedrooms featuring additional private garden areas. The master bedroom has its own outdoor Jacuzzi and is located adjacent to the study, which can be converted into an extra bedroom. Taking advantage of its romantic oceanfront locale, Villa Hale Malia offers lovebirds a choice of settings to share a few memorable moments.With a contemporary approach to tropical minimalism, Villa Hale Malia is a refined holiday retreat that makes full use of its dramatic hillside and oceanfront location. Miskawaan Residences are two villas next to each other which open up and combine to make eight bedrooms.Double timber doors, an enchanting lotus pond and elegant Thai-inspired artwork greet you on arrival. Seven spacious en-suite double and twin rooms stretch out in front of you surrounded by landscaped gardens, patio areas and a luxuriant lawn. 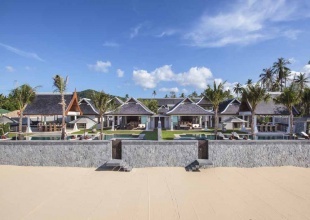 Nestled away on the West coast of Koh Samui, on a beautiful white sand beach, you will find Waimaire with nothing but luxury living in mind. Waimarie (pronounced Why-mar-ee) means “peaceful waters” in the language of the New Zealand Maori. This beautiful self contained villa offers all you need and more for the ultimate get away. 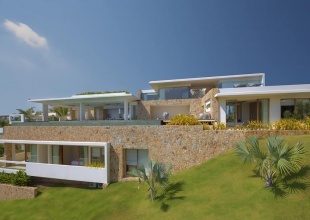 Sava - Villa Amarelo breathes tropical style and offers a distinctive luxury beachside appeal. The villa features 6 spacious en-suite bedrooms - three upstairs, three poolside - two of which are sea facing master suites with dramatic views right from their king size beds. The guest bedrooms cater to range of requirements and include two twins, ideal for older children of friends sharing. 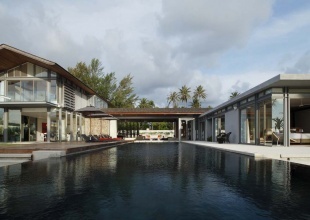 Villa Cielo is a stunning contemporary private beachside residence situated right next to one of Thailand\'s most beautiful and unspoiled beaches — Natai, in the province Phang Nga.